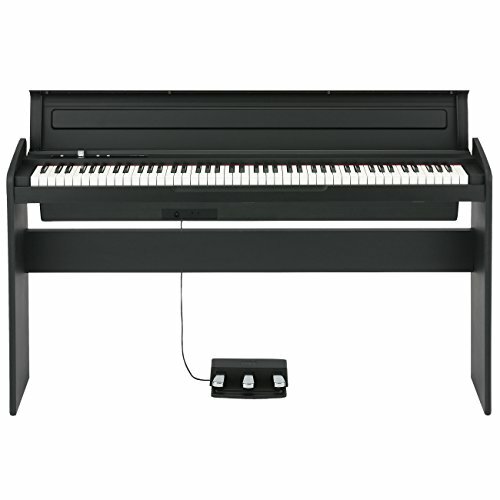 Buying a Digital Piano Today? Congratulations on your decision to buy a digital piano! They are a great way for beginners and pros alike to share their passion for music without having to spend the big bucks! *This affordable Yamaha digital piano is one of the best for any piano student on a budget. It has a fantastic sound and a gorgeous dark chocolate color! Digital pianos are fun, sound great, they are portable, they don’t need tuning and they are much more affordable than an acoustic piano. But which ones are the best affordable digital pianos? 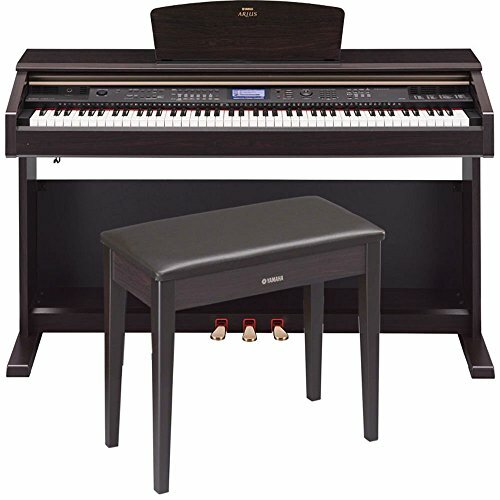 Cheapest Digital Piano for Sale! The first thing you need to look for in a digital piano is the number of keys. If you are serious about learning how to play the piano, or you are taking classes already, then I strongly recommend going for the full 88 keys. They are a little bit more expensive than others with less keys, but you really want to get as close to a real piano as possible, right? If your answer is yes, then choose a digital piano with 88 keys. *The one you see on this picture is the cheapest full-sized digital piano for sale I could find! 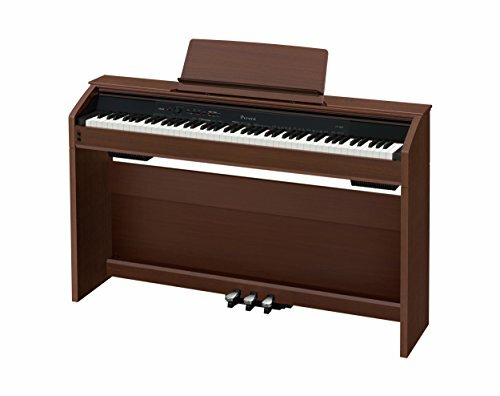 It is a great Yamaha digital piano that is very compact (I have it in my dining-room, behind my dining table…) and the sound is absolutely delightful! My husband hooked it up for me on a nice amplifier too, so when I want to entertain my friends or family I can play even louder! It comes with the stand and the sustain pedal, which is very important for any piano player. If you want to buy one for yourself or your teenager, just click on it! *Here is a nice demonstration of how beautiful this digital piano sounds… the lady is playing different sounds too… Very nice! Beautiful Digital Piano that Looks Like a Real Piano! To really get the feeling of playing a “real” piano, I also recommend choosing a digital piano that comes with the stand and pedals…….. The pedal is extremely important! You might not know how to use it yet, but believe me, it makes all the difference when playing……… Again, they are slightly more expensive than others without the stand and pedals, but it will be worth it, I promise…. *The one you see above is a gorgeous Yamaha Arius digital piano for sale that looks just like a real acoustic piano… but at least 5 times cheaper! If you can afford one of these, then go for it! The sound is top of the line! Last but not least, choose a digital piano that comes with a decent quality of speaker system, after all it’s all about making music right? We want to hear those beautiful sounds you are about to make……. And make sure the keys come with touch response, meaning you can control your playing….. Using a light touch when needed or strong. This is also very important when you really learn how to play. Trust me on this one also….. 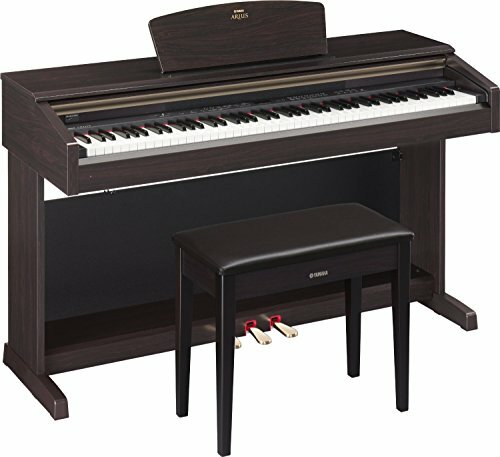 This is also a beautiful and affordable full-size electronic piano with the bench and the three sustain pedals! It has an ‘authentic’ real piano feel and sound! Great for any piano beginners or professional players too! *Here is a guy playing on his new digital piano! 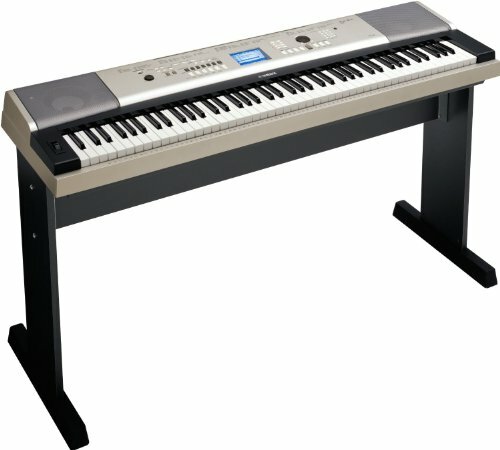 Cheap Korg Digital Piano for Sale! 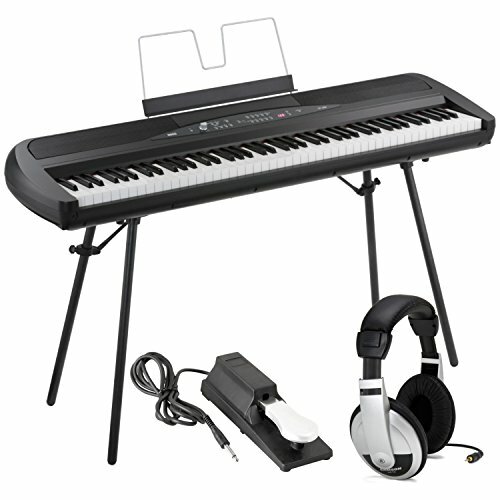 This is a beautiful looking and affordable black Korg 88-key digital piano! It is very classy and stylish! It also has a very nice compact size, perfect for any small bedrooms or dorm rooms! I had the chance to play one of these in my local mall and I was impressed with the sound quality! It is very rich and very similar to a real piano! The keys feel very nice, big and heavy, just like an acoustic piano. Overall, I would definitely recommend this beautiful Korg piano to a student. *Watch a great demonstration of this beautiful Korg LP-180 digital piano! *Here is the White Korg 88 Key Digital Piano for Sale! I LOVE beautiful white digital pianos! I had to show the white Korg too! Great Affordable Professional Looking Digital Piano! Casio is also an excellent digital piano brand and this gorgeous Casio Privia looks just like a real acoustic piano, doesn’t it? I LOVE this rich oak brown color! This is also a high-quality digital piano for sale at an amazing price! The Casia Privia line of pianos have beautiful, authentic grand pianos sound! 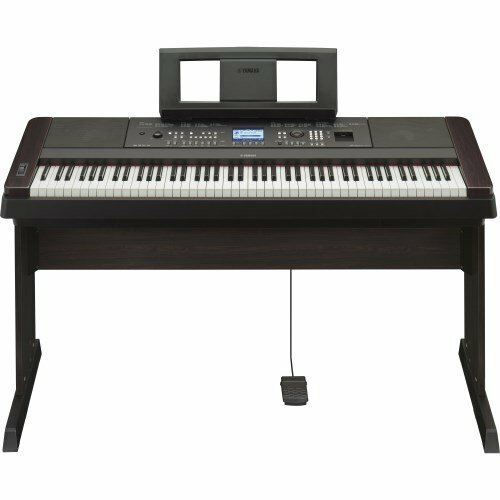 Perfect for beginners and intermediate piano players looking for a nice digital piano that is below or at one thousand dollars. It has a nice built-in musical library with 10 live philharmonic orchestra performances songs that you can use in your practice! The keys have a perfect hammer action that will allow more experienced players to play from pianissimo to fortissimo in a smooth way! *Look at this guy playing on a Casio PX-860 Privia Digital Piano! 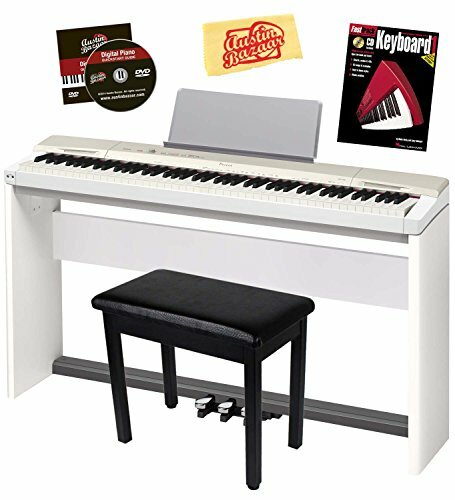 Best Affordable Casio Digital Piano Bundle! I love digital piano bundles! You will get everything you need to start your piano practice! 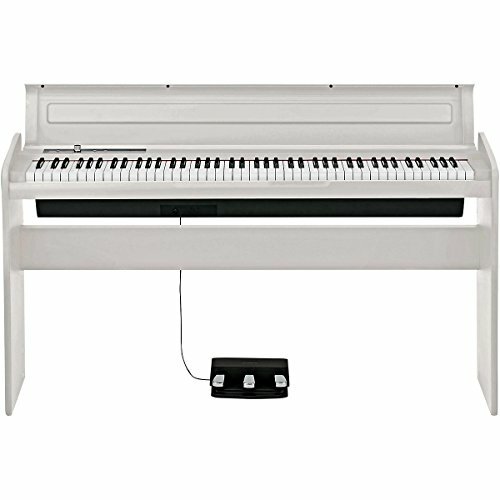 Casio is a great digital piano brand and this gorgeous white digital piano comes with a high-quality sound system and the stand, bench, pedals, DVD, book and dust cover! Overall this is an amazing digital piano and the sound is perfect! The keys feel very real! It also fits almost any living-space! Wonderful Christmas gift idea for the future musician in your home! Nice KORG Portable Digital Piano Bundle! Great Affordable Digital Piano for Teenage Boys! The great thing about this Korg digital piano is that besides being extremely affordable, you get a “bundle” package. It comes with the stand, bench, sustain pedal and headphones. It is a great deal for the money! Perfect gift idea for teenage boys who love to play piano keyboards! Great for practicing quietly in their bedrooms, since it comes with nice high-quality headphones!